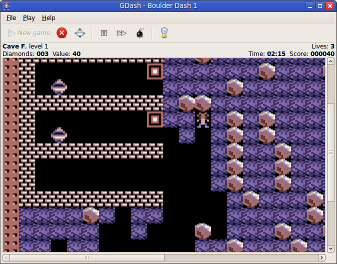 GDash is a Boulder Dash clone. The main goal of the project is to implement a clone which is as close to the original as possible. The game runs under Windows, Linux and other Unix clones, and also on Mac. For compiling, you need the GTK+ dev files, SDL2, SDL2_Image and SDL2_Mixer (with dev files). Read more about GDash in the Boulder Dash Forum. GDash has a cave editor, supports sound, joystick and keyboard controls. It can use GTK+, SDL2 and OpenGL for drawing. The OpenGL engine can use shaders, which provide fullscreen graphical effects like TV screen emulation. The game is licensed under MIT license terms. See the COPYING file in the source tree. GDash has an unofficial Pandora port. For a Mac port, see Mac port.